Most people find out their blood type when they first give blood. But you can discover your likely blood type before you become a donor. If are curious about your blood type, you can attend a What’s Your Blood Type event to register as a new donor and have a free blood type test. The events are held close to our 23 permanent donation centres throughout the year. The map shows when we're in your area or there's information about venues, dates and time below. Once you've found an event near you, that's all you have to do. There's no need to book, just turn up on the day. Before the test, we’ll take your details and register you as blood donor. The test itself takes about 5 minutes and all we need is few drops of blood from your finger. There are no big needles, we promise. After the test, you'll learn about the lifesaving power of blood and the amazing difference our blood donors make. Your blood type will be confirmed when you donate blood in the future. 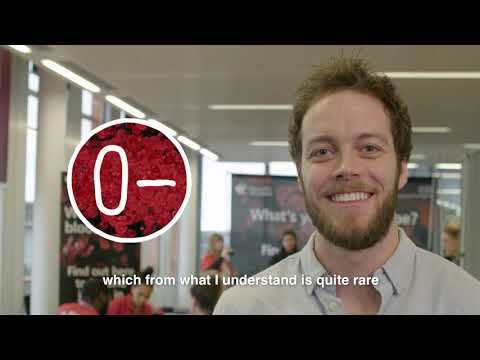 Watch the video to see what happens at a What's Your Blood Type event. Each blood type is important and we need donors of all types to ensure there's the right blood for the patients who need it.